Like so many gimmicks I’ve learned in editing along the way, black and white used to be that way for me. Crappy photo? “Fix it” in black and white! Sometimes, I’ll grant you, a good black and white conversion can save a lousy or boring shot. But now I try to save black and white for when it’s appropriate. What you’ll hear a lot of great photographers say is to reserve black and white in portraits for when you need to focus on emotion. I think this is a great rule. I like how black and white can cut straight to the core of an image or moment. It takes away all the clutter and forces the viewer into the drama. That is a powerful thing. This image is of Kenya. She is holding her baby girl, her first child, for the first time. She had been in labor for two days. 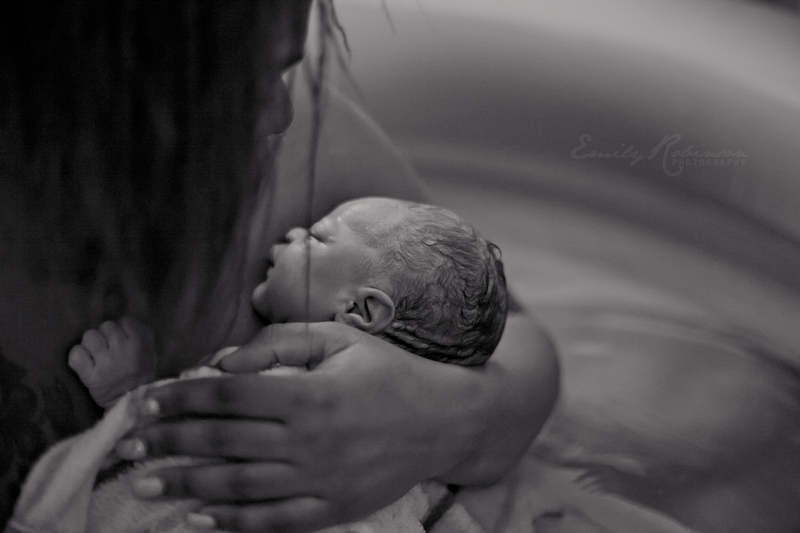 She was exhausted, but determined to have the kind of powerful, beautiful birth she had planned for. Her reward is evident here. Be sure to click over to I Heart Faces and take a look at some of the amazing entries, or post your own if you haven’t already. So amazing. What a moment to capture. Brought tears to my eyes! Brings me back to my own wonderful moment, just over a year ago!